Reading articles online is quite useful due to its constant update. But few Internet users prefer listening to articles rather than reading. Here is an Apple iPhone App that will help you convert text articles into audio. SoundGecko will convert any text in webpage to Mp3 in few seconds. 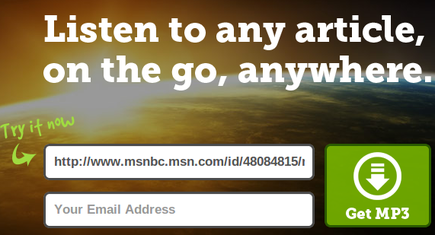 All you have to do is paste the URL of an article, submit email address and click on ‘Get Mp3‘ button. Within few seconds Mp3 version of entire article will be sent to your email ID. You can listen to article when your travelling, having coffee or while you take a walk. One of the few disadvantage is that Audio file will be sent to Email ID rather than direct download and sometimes even unnecessary texts like ´Share this page via Facebook or twitter’ will be recorded. There is also a Google Chrome Extension and online version of SoundGecko text-to-audio transcribing service.